For more than 150 years, corn refiners have been perfecting the process of separating corn into its component parts to create a myriad of value added products. The corn wet milling process separates corn into its four basic components: starch, germ, fiber, and protein. Corn refiners use #2 yellow dent corn, which is removed from the cob during harvesting. An average bushel of yellow dent corn weighs 56 pounds. Approximately 70 percent of the kernel is starch (from the endosperm), about 10 percent is protein (predominantly gluten), four percent is oil (extracted from the germ), and two percent is fiber (from the hull). It is the goal of the corn refining process to separate each component and then further refine it into specific products. Corn arrives at the refining facility by truck, barge or railcar. Refinery staff inspect arriving corn shipments and clean them twice to remove pieces of cob, dust, chaff, and foreign materials. The corn is then conveyed to storage silos, holding up to 350,000 bushels, until it is ready to go to the refinery for steeping, the first processing step. Each stainless steel steep tank holds about 3,000 bushels of corn for 30 to 40 hours of soaking in 50 degree Celsius water. During steeping, the kernels absorb water, increasing their moisture levels from 15 percent to 45 percent and more than doubling in size. The addition of 0.1 percent sulfur dioxide to the water prevents excessive bacterial growth in the warm environment. As the corn swells and softens, the mild acidity of the steepwater begins to loosen the gluten bonds within the corn and release the starch. After steeping, the corn is coarsely ground to break the germ loose from other components. Steepwater is condensed to capture nutrients in the water for use in animal feeds and for a nutrient for later fermentation processes. The ground corn, in a water slurry, flows to the germ separators. Cyclone separators spin the low density corn germ out of the slurry. The germs, containing about 85 percent of corn’s oil, are pumped onto screens and washed repeatedly to remove any starch left in the mixture. A combination of mechanical and solvent processes extracts the oil from the germ. The oil is then refined and filtered into finished corn oil. The germ residue is saved as another useful component of animal feeds. The corn and water slurry leaves the germ separator for a second, more thorough, grinding in an impact or attrition-impact mill to release the starch and gluten from the fiber in the kernel. The suspension of starch, gluten, and fiber flows over fixed concave screens, which catch fiber but allow starch and gluten to pass through. The fiber is collected, slurried, and screened again to reclaim any residual starch or protein, then piped to the feed house as a major ingredient of animal feeds. The starch-gluten suspension, called mill starch, is piped to the starch separators. Gluten has a low density compared to starch. By passing mill starch through a centrifuge, the gluten is readily spun out for use in animal feeds. The starch, with just one or two percent protein remaining, is diluted, washed eight to 14 times, rediluted, and washed again in hydroclones to remove the last trace of protein and produce high quality starch, typically more than 99.5 percent pure. Some of the starch is dried and marketed as unmodified corn starch, some is modified into specialty starches, but most is converted into corn syrups and glucose. Starch, suspended in water, is liquefied in the presence of acid and/or enzymes which convert the starch to a low-glucose solution. Treatment with another enzyme continues the conversion process. Throughout the process, refiners can halt acid or enzyme actions at key points to produce the right mixture of sugars like glucose and maltose for syrups to meet different needs. In some syrups, the conversion of starch to sugars is halted at an early stage to produce low-to medium sweetness syrups. In others, the conversion is allowed to proceed until the syrup is nearly all glucose. The syrup is refined in filters, centrifuges, and ion-exchange columns, and excess water is evaporated. Syrups are sold directly, crystallized into pure glucose, or processed further to create high fructose corn syrup. Glucose is one of the most fermentable of all of the sugars. Following conversion of starch to glucose, many corn refiners pipe glucose to fermentation facilities where the glucose is converted to alcohol by traditional yeast fermentation or to amino acids and other bioproducts through either yeast or bacterial fermentation. After fermentation, the resulting broth is distilled to recover alcohol or concentrated through membrane separation to produce other bioproducts. Carbon dioxide from fermentation is recaptured for sale and nutrients remaining after fermentation are used as components of animal feed ingredients. Who do I contact to purchase corn refined products (starch, syrup, sweeteners, etc.)? Please contact the corn wet milling companies directly. A list of CRA Members with information about which products each company produces and links to their websites where you can find contact information is available and can be found here. Note: If you are looking to export refined corn products (corn oil, corn gluten feed, etc. ), please follow the link above and contact the appropriate CRA Members. Where can I get information on purchasing corn for export? The U.S. Grains Council lists a number of providers of commodity corn as well as details on purchasing specifications. Please see their website here. Which corn refining company has the greatest share of the corn sweetener markets? The CRA does not track information related to product pricing, market share or individual companies. Industry analysts such as Credit Suisse, LMC International, McKeaney-Flavell, or SK Patil and Associates can provide detailed reports on product markets, pricing, market share, and other market-related information. Note: None of the analysts noted above have an affiliation with the CRA, nor does the CRA recommend or endorse any particular analyst. The list is informational only and not comprehensive. CRA represents only those companies that wet mill corn. The association does not have any individual or associate memberships. Where can I get information on ethanol? For information on ethanol, contact Growth Energy or the Renewable Fuels Association (RFA). Growth Energy, 701 8th Street NW Suite 450, Washington, DC 20001; telephone (202) 545-4000. You can visit the Growth Energy website here. Renewable Fuels Association, 425 Third Street, SW, Suite 1150, Washington, DC 20024; telephone 202-289-3835; fax 202-289-7519. You can visit the RFA website here. American Coalition for Ethanol (ACE), 5000 South Broadband Lane, Suite 224, Sioux Falls, SD 57108; telephone (605) 334-3381. You can visit the ACE website here. Where can I get information on corn flakes, corn grits, and cornmeal? Corn flakes, corn grits, and corn meal are made using the “dry milling” process. For information on corn dry milling, contact the North American Millers’ Association (NAMA), 1400 Crystal Drive, Suite 650, Arlington, VA 22202; telephone 202-484-2200, fax 202-488-7416. You can visit the NAMA web site here. There are thousands of uses for corn products, and the list continues to grow. 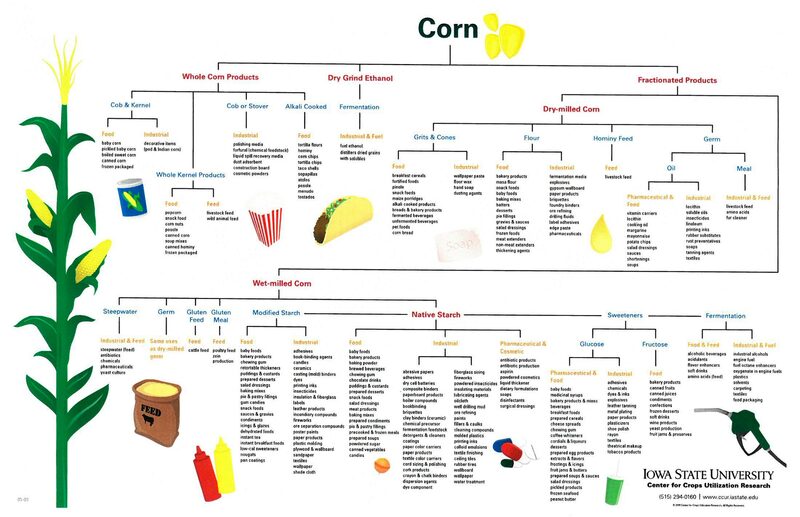 Corn products are used in food and beverages, paste and adhesives, textiles, building materials, household needs, personal care, pharmaceuticals, mining/metallurgy, paper, paper-related products, animal feed products, and for industrial uses. A simple comparison of the percentage of glucose and fructose reveals its similarities to table sugar. How do sugars affect my body? Sugars give you energy in the form of calories and provide building blocks for other molecules your body needs such as proteins and fats. What benefits does HFCS provide other than sweetness? In 1983, the S. Food and Drug Administration (FDA) formally listed high fructose corn syrup as safe for use in food and reaffirmed that decision in 1996. Many confuse pure “fructose” with “high fructose corn syrup.” Recent studies that have examined pure fructose have been inappropriately applied to high fructose corn syrup and have caused significant consumer confusion. High fructose corn syrup never contains fructose alone, but always in combination with a roughly equivalent amount of a second sugar (glucose). This rule will have very little effect on high-fructose corn syrup (HFCS) because the leading food companies using HFCS have indicated they intend to provide disclosure for products made with HFCS from bioengineered corn, whether disclosure is required or not. Consistent with the law, the proposed rule would not require disclosure of HFCS from bioengineered corn because HFCS is a pure sugar; it does not contain DNA. So, HFCS is the same whether it was or was not produced from bioengineered corn. You’ve probably seen the negative headlines about high fructose corn syrup. Have you ever wondered if the media hype is true? Here are some of the most common inaccurate statements about this misunderstood sweetener along with the actual reality. Myth: High fructose corn syrup is to blame for obesity. Fact: Obesity is caused by consuming more calories than are expended and Type II diabetes is associated with obesity. While high fructose corn syrup contributes to calories in the diet, there is no scientific evidence that high fructose corn syrup is a unique contributor to obesity or diabetes. In fact, the U.S. Department of Agriculture data shows that consumption of high fructose corn syrup has actually been declining while obesity and diabetes rates continued to rise. Around the world, obesity levels are also rising even though HFCS consumption is limited outside of the U.S. Many other factors contribute to rising obesity levels including changes in lifestyle, diet and exercise and are unrelated to HFCS. Myth: High fructose corn syrup is sweeter than sugar. Fact: Sorry, no. High fructose corn syrup and sugar (sucrose) have almost the same level of sweetness. HFCS was made to provide the same sweetness as sugar (sucrose) so that consumers would not notice a difference in sweetness or taste. 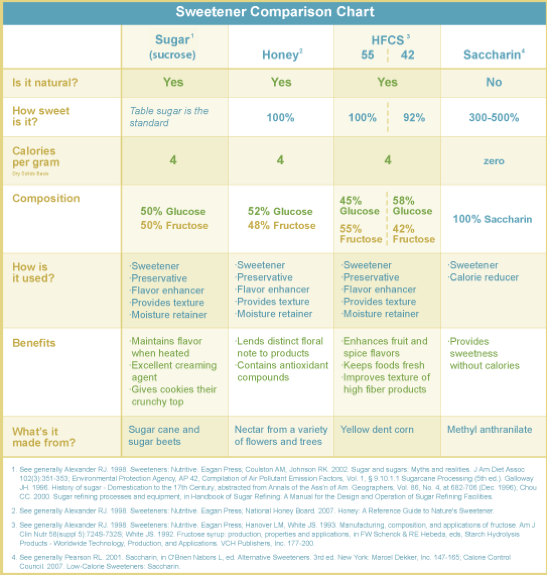 In fact, one type of HFCS commonly used in foods (HFCS-42) is actually less sweet than sugar.